With their adorable faces and soft cuddly bodies, vintage Mickey and Minnie Mouse stuffed toys hold a special place in the hearts of many Disneyana collectors. In 1928 the loveable mouse couple made their film debut. Although many people believe that they first appeared in the November 18th release of the cartoon Steamboat Willie, they had in fact been featured in two cartoons earlier that year, Plane Crazy and The Gallopin' Gaucho. Although neither of the two earlier cartoons met with much success, Steamboat Willie was the first Mickey Mouse cartoon to find a distributor and is considered the debut of Mickey and Minnie. The Walt Disney Company actually gives Mickey's birthday as November 18, 1928 coinciding with the release of Steamboat Willie. Designed patterns of Mickey Mouse, and other Disney characters, to sell so homemakers could make their own stuffed dolls. Vintage Disneyana refers to all Disney items that were manufactured, produced or distributed before the death of Walt Disney in 1966. Generally, any Disney items from before 1966 are in higher demand by collectors and usually command higher prices. 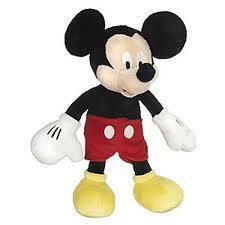 Charlotte Clark Minnie Mouse stuffed toy from the 1930s. Minnie is wearing her red polka dot skirt and is found on Worthpoint. Whether you are new to Disney collectibles or are an experienced collector, finding vintage Mickey and Minnie Mouse stuffed toys to add to your collection is certain to bring a smile to your lips as big as the ones on the faces of these adorable stuffed animals.